Our Pet Retention Program is intended to provide help for pet owners who wish to keep their pet but are experiencing hardship. If you would like to speak with an Admissions Placement Coordinator about alternative options to surrendering your pet, email admissions@utahhumane.org or click HERE to schedule a call Sunday through Friday. One of our Admissions Placement Coordinators will call you between 10 a.m. and 11 a.m. for a 15-minute consultation to discuss alternatives and resources available. The Humane Society of Utah exists to provide lifesaving resources for animals in need. Owners may decide to surrender their pet(s) to HSU if they have no other available options. If you need to surrender your pet, please schedule an appointment through our Admissions page. If you have found a lost or stray animal, contact your local animal control services. Click HERE if you are experiencing behavioral issues with your pet. Find additional resources for common pet ownership issues below. * The inclusion of a service, organization, or program in this listing is not an endorsement or recommendation. We are not able to guarantee the quality of these services and strongly suggest that you check them out yourself before using a specific service. As a responsible pet owner, you can rehome your pet and save them the stress of entering an animal shelter. You know your pet better than anyone, and with the resources on this Pet Retention page, you can find a new loving home for your pet. We encourage you to look into alternative solutions to keep your pet, if possible, before making the decision to rehome your pet. Rehome by Adopt a pet.com and The Petco Foundation. Create a pet profile, receive applications, and screen potential adopters from your home. Adopt-a-Pet.com gives you a personalized adoption agreement that you and your adopter can sign online. 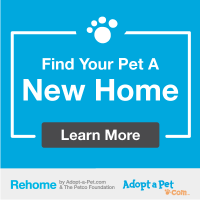 This website, founded by Adopt-a-Pet.com and the Petco Foundation, allows you to rehome your pet with peace of mind. You can create a profile for your pet, review applications of potential adopters, screen and meet adopters, and finalize the adoption with Adopt-a-Pet’s personalized adoption agreement. Your pet can go straight to a new home without experiencing the stressful shelter environment. Home-to-Home - A Good Sam Animal Rescue program. Home-to-Home helps pet owners keep pets in their homes until a loving adopter is found, reducing the stress of the rehoming experience. They offer a full range of services to support you and your pet during what is often an emotional process. This website helps to reduce the stress of the rehoming experience. Adopters can obtain their new companions directly from the owner, ensuring that the pet never has to see the inside of a shelter. This organization has limited admissions. To make an appointment and to receive a copy of the Surrender Contract and Incoming Pet Profile, email adoptions@anbrescue.org. Dog rescue that will take owner surrenders. You must fill out an owner surrender application online. You should receive a response from the Rescue Rover team within a week. Keep in mind it can take up to a couple weeks for a foster home to be made available for your dog. This organization has limited admissions. BAM may ask you to continue housing your pet until an adoptive home is found. This can reduce the stress of the rehoming experience. This organization will only take English or British Bulldogs. This organization accepts herding breeds from the public on a case by case basis. Some apartments do not allow cats or dogs. View this Apartment Guide to see places that allow pets before signing a rental agreement. The inclusion of a service, organization, or program in this listing is NOT an endorsement or recommendation. We are not able to guarantee the quality of these services and recommend that you gain additional information before using a specific service. UofU Pro Bono Initiative - Get legal advice for free from law students under the supervision of practicing attorneys at the UofU. Pets provide companionship and fun, but for some people, a dog or cat can also trigger sneezing, sniffles and worse. There is a myth that pet allergies are caused by animal hair. Click HERE to read information from the American Academy of Allergy, Asthma and Immunology. Community cats (also known as feral, stray or free-roaming cats), are the most-at-risk animals in shelters throughout the U.S. Since community cats are at great risk of being killed if they enter shelters, many shelters and rescue groups ensure that they do not end up there by organizing and operating humane trap/neuter/return (TNR) programs. Trap/neuter/return is a comprehensive management plan in which healthy community cats are spayed or neutered, vaccinated and then returned to their outdoor communities. Read our Kitten Season Reminders before surrendering a litter of found kittens. Do you need assistance feeding your pet? We may be able to help! Email us for information about our Pet Food Bank at info@utahhumane.org. You can also contact the Utah Food Bank for assistance with pet food. Provides high-quality pet food to pets of low-income individuals. To obtain food from this organization, proof of low-income must be provided. Individuals may receive food for their animal once per quarter. Pets must be spayed/neutered in order to receive assistance. An official request must be made to receive food. See website for form. This organization provides pet food, supplies, and medical care for pets of the homeless population in Salt Lake City. Every Sunday at 12:00 noon, volunteers are available at Pioneer Park to give out needed pet supplies. Additionally, they partner with local veterinary clinics to provide free vaccinations and microchips. They also try to help cover costs of spay/neuter procedures, and other emergency surgeries where possible. Which pet food should you feed your pet? Red Rover Relief Safe Escape Grants - Funding through this program is primarily for boarding costs of the pet while client is in domestic violence shelter, though other boarding related costs (such as vaccinations) may be covered as well. For client safety, applications must be submitted by a domestic violence shelter representative. Safe Place For Pets - Website that provides names and contact info for pet friendly shelters and housing for victims attempting to escape domestic abuse. Houses service animals onsite, other pets can be housed with the local animal shelter while the client is staying at the shelter. Attempts to help clients obtain documentation for their pets to be considered a support animal or will work with local animal shelter to board pets while clients are in the shelter. Has a contract with Purple Paws that can house pets; pets will not be on site. Able to house emotional support and service animals only. Able to house emotional support animals and service animals only. Have a local veterinarian that is able to work with accomodations for pets. Has a program for fostering pets of domestic abuse survivors, does not house pets on site. Occasionally can accomodate pets on a case-by-case basis. Cannot house pets on site but assists with finding temporary housing for pets. This shelter is pet-friendly provided that they have the available space.